Eatontown, N.J. Kessler-Ellis Products (KEP) Marine, the manufacturer of industry-leading marine sunlight readable displays, and high-quality marine hardware and software products, announced today its camera and video recording system, the KEPM-CAM. Available in two models, the KCAM-RAC and KEPMCAM-RAC-AC computer systems include an Intel i5 and i7 microprocessor, respectively, and can support up to 16 feeds. 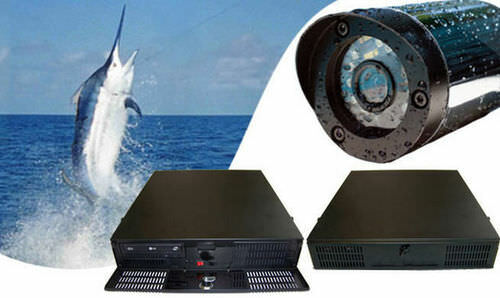 Featuring secure, tamper-proof software with date and time stamping capabilities that satisfy the requirements of recent regulations in tournament fishing, motion detection, alarming, and remote access via modem or smart phone, the KEPM-CAM is one of the most innovative video recording solutions available for the marine market. The new KEPM-CAM is extremely powerful and packed with advanced features that make it the ideal recording system for commercial and recreational marine use, as well as many industrial and residential applications, said Tony Zuccarelli, Vice President of KEP Marine. It is indisputably the most versatile, convenient and reliable video recording system available, and ideal for anyone who want to keep their eye on the action. The KCAM-RAC includes a 2TB rackmount digital recording system, 8GB of memory and an Intel i5 processor. The KEPMCAM-RAC-AC includes a 4TB digital recording system, 16GB of memory, an Intel i7 processor and 500GB of removable storage. Both systems feature a CD/DVD read-write optical drive, a key fob for remote start/stop and a Windows 7 Pro operating system. The recording systems are fully compatible with the KEP KCAM-IP2HD waterproof outrigger/rail-mount Hi-Definition camera as well as the companys full line of marine cameras. The systems are housed in U2 rackmount enclosures, operate in 110/240AC power environments and have an operating temperature range of 0- to 65-degrees C (32- to 149-degrees F). KEP offers a range of options for the KEPM-CAM including storage, solid-state hard drives, Blu-ray and memory options. The KEPM-CAM recording system is easy to install and each unit is factory preprogrammmed to match the operators individual needs. KEPs latest software makes it easier then ever to view page configurations, playback video, record, and edit footage. In addition, insurance companies, courts and tournament officials, accept it as legal tamperproof software. The new all-in-one KEP recording system has all the features, components and capabilities needed; eliminating the need for video scalers and other expensive, additional equipment.